Talk about a grand entrance. When dreaming up our most recent collection, Palazzo, the Sara Baldwin Design team and Paul Schatz decided to combine forces and go big or go home. The thirteen large-format patterns the designers released are the epitome of elegance. 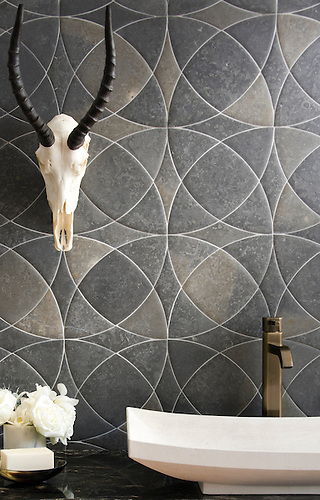 Arbus, a hand-cut stone mosaic, shown in polished Soccoro Grey, Nero Marquina, Carrara, and honed Cavern. For this series, our team of designers chose to focus on the spaces where we gather. The main objective while creating this collection was to get inspired by spaces that are not merely welcoming but also bold and extravagant. Because by constructing the right atmosphere, a space, whether it be public or private, can say, “Hello,” while also silently making a statement that is far more powerful. Delaunay, a hand-cut stone mosaic, shown in polished Cloud Nine and Dolomite. Once again, we find ourselves returning to the classics. But, really, the Renaissance was the epitome of perfect symmetry, so you cannot blame us for being swayed by the flawless order of this enlightened period while creating our patterns in the current century. With that said, although entirely our own, the oh-so-satisfying symmetry of Lucius and Hadrian both include elements of perfectly repeating squares. The subtly emerging circles within Zazen are all in reference to the perfect order that was always a consistent theme within Renaissance and Byzantine art. We modernist humans, carrying an iEverything, still get all warm and tingly over the foreseeable order found within the consistency of circles and squares. Go figure. Zazen Grande, a waterjet stone mosaic, shown in Venetian honed Cavern by Paul Schatz. The Palazzo Collection as a whole is undeniably lavish. Yet, mosaics that are substantial in scale can still harness intimacy and be soothingly inviting. There is no better example of this than in our plush design, Cableknit. We harness so much inspiration from fabrics and stitching, and this woven pattern, although constructed entirely from natural marble, gives off the cozy vibe of your favorite snuggly winter blanket. Our Venetian honing technique is responsible for the “soft-to-the-touch” appearance of this braided design. Cable Knit Large, a waterjet stone mosaic, shown in Venetian honed Dolomite. First impressions are significant. A grand foyer or extravagant entryway needs to be inviting and memorable. Our incentive for the Palazzo Collection is to create floors, as well as walls, that draw in its guests and inhabitants. To house and welcome those who enter the space and offer a setting that unfolds future memories that will sustain, like marble, throughout the ages. 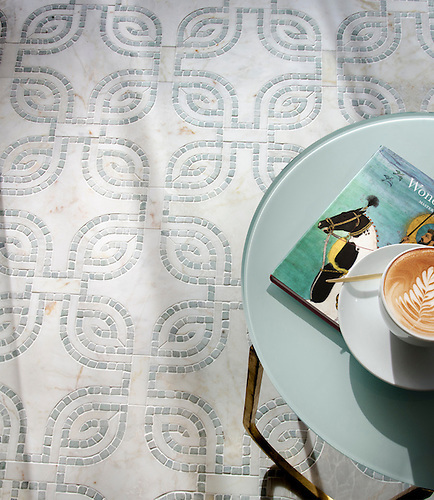 Heathrow Grande, a hand-cut and waterjet mosaic, shown in honed Cloud Nine and tumbled Ming Green by Paul Schatz for New Ravenna. Lucius, a hand-cut stone mosaic, shown in polished Calacatta Tia and honed Thassos. Arbus Medium, a hand-cut stone mosaic, shown in polished Calacatta Radiance, Wujan Jade, Nero Marquina, and Kay’s Green. 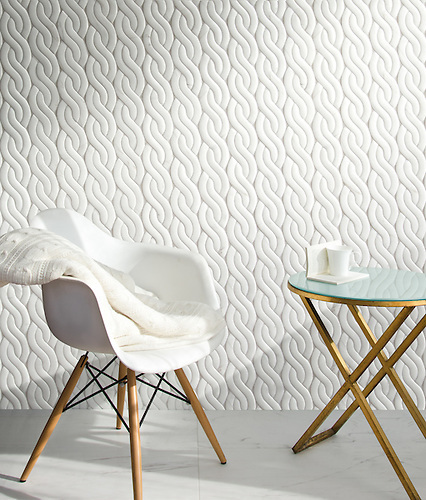 Cyril, a hand-cut stone mosaic, shown in polished Calacatta Tia and Bardiglio. Cyril, a hand-cut stone mosaic, shown in polished Saint Laurent and honed Lagos Gold. Delaunay, a hand-cut stone mosaic, shown in honed Palomar and Montevideo. Lancaster Large, a hand-cut stone mosaic, shown in polished Calacatta Tia and Nero Marquina. Heathrow Grande, a hand-cut and waterjet mosaic, shown in tumbled Afyon White and Chinchilla Serenity glass. Heathrow Grande, a hand-cut and waterjet mosaic, shown in honed Cloud Nine and tumbled Ming Green. Hadrian, a hand-cut stone mosaic, shown in polished Cirrus, Dolomite, and Nero Marquina. 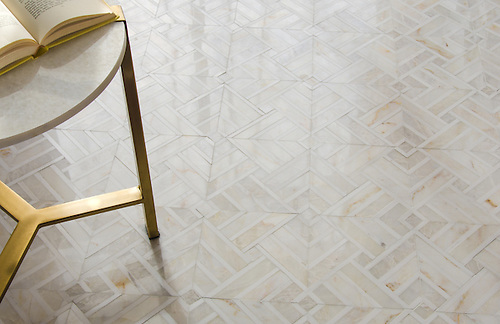 Delaunay Grand, a hand-cut stone mosaic, shown in polished Calacatta Tia and honed Thassos. Lancaster Medium, a hand-cut stone mosaic, shown in honed Afyon White and Horizon. Lucius, a hand-cut stone mosaic, shown in polished Calacatta Tia and Thassos. Zazen Grande, a waterjet stone mosaic, shown in Venetian honed Cavern. Zazen Grande, a waterjet stone mosaic, shown in Venetian honed Bianco Antico.